Last Stand of Dead Men is the second to last book in Derek Landy’s wonderful Skulduggery Pleasant series, and it sure is one tense, action-packed read. The further we’ve been getting to the end of the series, the more dramatic the events of each book have been. The magic world has been teetering on the brink of war for some time now and it’s in Last Stand of Dead Men that war finally breaks out between the Sanctuaries. An epic magic battle ensues, with death and destruction galore. As the front cover says, ‘no one is safe.’ The characters that we’ve come to love are caught up in the middle of the war and not everyone survives. Heroes become villains, enemies fight together, some people aren’t who we thought they were, and others look completely different from the last time we saw them. Derek also introduces us to new characters and creations, my favourite of which are the Warlock’s minions, the Wretchlings. Last Stand of Dead Men is the darkest of the series so far and we see the darker side of Skulduggery coming out. While it doesn’t have the same humour as some of the earlier books, the scenes with Scapegrace and Thrasher provide some light relief and had me laughing out loud. One of the things I like the most about Derek’s books is his brilliant dialogue and there is plenty of this in this book. Skulduggery will do anything to save Valkyrie and I certainly can’t wait until September next year to find out how it all ends. Will Skulduggery save her or will Darquesse destroy the world? Win a copy of Last Stand of Dead Men! Thanks to HarperCollins NZ I have a copy of Last Stand of Dead Men to give away. All you have to do to get in the draw is enter your name and email address in the form below. Competition closes Friday 4 October. The second to last book in the Skulduggery Pleasant series, Last Stand of Dead Men, is finally here! The last couple of books are going to be pretty epic and it will be really interesting to see how the series ends. I’ll post my review very soon and there will be a copy to win. Are you a huge Skulduggery Pleasant fan? Well here’s the competition for you. This is a new competition that HarperCollins and Derek Landy are running for all Skulduggery fans, to celebrate the release of The Maleficent Seven. There are some awesome prizes up for grabs and it’s super easy to enter. Read all about it below and enter your masterpiece. Exquisite Corpse is our very first fan works competition! We know you’re awesome. You know you’re awesome. We know that you know that you’re… you get the idea. But the thing is, sometimes it’s not enough to just know, sometimes you have to show everyone else. So, this is your chance. We’re looking for fan works, created by you, inspired by the Golden God himself. Derek, that is. And we’re going to have a theme. This month, unsurprisingly, the theme is Tanith Low. We love her. You love her. Get to it! You can submit anything… well, anything you’ve created. It could be a poem, a drawing, a short story (under 1,000 words, please, we know how prolific you all get, and Derek needs a little time to, you know, finish Book 8), it could be a Haiku, a clay model, a photo montage. Anything you like, as long as it was inspired by Tanith. Simply email it – or a picture of it – to us at skulduggery@harpercollins.co.uk. Derek will judge the entries, and then one lucky fan will WIN the chance to be featured in our newsletter and on the Skulduggery Pleasant website, as the creator of the Exquisite Corpse Work of the Month! Everyone who enters will get an exclusive The Maleficent Seven themed poster, plus we’ll also send the winner a signed copy of The Maleficent Seven. 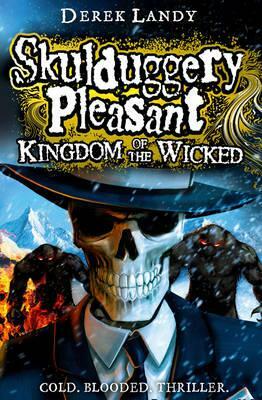 Kingdom of the Wicked is the latest installment in the very popular Skulduggery Pleasant series by Derek Landy. I had been very eager to read the seventh book, and so as soon as I got my hands on my new copy, I sat down and began to read feverishly. From the very first page it is obvious that this book is going to be even better than the previous one. Skulduggery and Valkyrie have got their hands full, as numerous mortals across the city are suddenly gaining magical powers, and are dreaming of a man named Argeddion. They start to investigate, and so begins a new adventure, full of hideouts, evil teenage sorcerers, and lots of fighting. Valkyrie is still struggling to keep control of her evil half, Darquesse, and her reflection is becoming more life-like by the day. When Valkyrie is given a temporary power (or perhaps curse), the trouble- and adventure- increases. The plot thickens and twists as the book progresses, more challenges being thrown at Skulduggery and Valkyrie as they strive to defeat the evil Kitana and her friends, Doran, and Sean. Kingdom of the Wicked introduces you to many new characters and takes you to various new locations, such as the magical gaol (fit with the ultimate security system), the Alps (home to not-so-friendly Abominable Snowmen) and a couple of different dimensions (really). 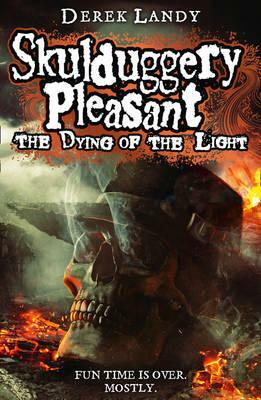 It is packed with the humour, adventure, and originality that made us all fall in love with the Skulduggery Pleasant series in the first place. ‘Well done, dear,’ Valkyrie’s mum said. Valkyrie choked on her cereal and her mum looked up sharply. Vaurien Scapegrace returns, providing even more laughs. If you haven’t read the series, Scapegrace is (at this point in the series) the head of a zombie, who was once a murderer wannabe. I’m sure you can already tell that Scapegrace, like so many of the characters, is a very unique person, who adds even more flavour to the addictive taste of the book. All of this is just a hint of the experiences promised, should you choose to read the latest Skulduggery Pleasant adventure. I will warn you though; once you begin reading, you will never want to stop!